from an opposing standpoint, if I am fighting against a warrior, I now have to play around Brawl x2, Execute, Whirlwind, and Worgen+Charge+Inner Rage. The first two basically prevent me from playing big cards or I'll get punished for it, the Whirlwind/ Ravaging Ghoul clears out low hp units, and the Worgen combo kills me from 30hp if I don't have a taunt up. Poor Warrior's Grommash Hellscream, but maybe better. Worgen + Charge + Inner Rage or Cruel Taskmaster for a 16 damage charge-in. Use two cards to enrage for 20 damage. This is a devastating combo as it only takes 6 to 8 mana, giving a Warrior player at least 2 mana to remove taunt( Owl silencing or 1-mana single removal), or just play a weapon for an extra 3 or 4 damage. You can use Rampage to spend 2 mana for extra 6 damage. Worgen + Charge + double Inner Rage + double Rampage deals 32 in total. Even with only one Rampage it's pretty much lethal out of full health with weapon. It's only too extreme to come true in actual game because you probably can't survive for having too many dead cards in hand. Interestingly, Worgen combo was employed by a Korean player in Blizzcon 2014, and successfully knocked out Kolento with a weapon topdeck. This charge-in combo is much less viable than its Druid or Shaman counterpart and similar to Arcane Golem + Power Overwhelming + Faceless Manipulator. Normally Warrior just go for Gromm Hellscream for lower burst but higher viability. 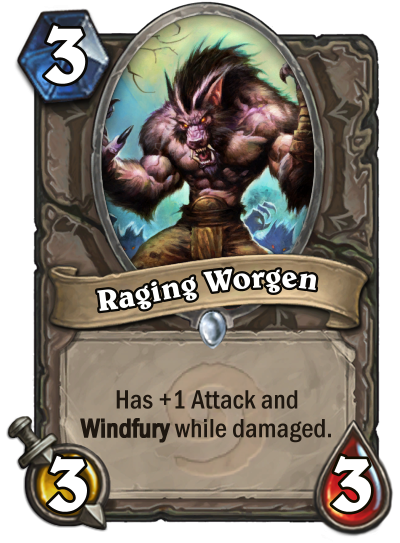 Raging Worgen + 1 Charge, 1 Inner Rage , and lets say 1 Cruel Taskmaster is still 20 damage to the face on a clear board.